Student organization WeListen was featured in a WDIV ClickOnDetroit story titled "Meet the students leading tough dialogue at the University of Michigan," by Meredith Bruckner. WeListen held their first session in September here in the Ford School. Lerner explains, “The idea was there are lots of ways to get people together, but in our minds the best way is small group conversations.” He noted, "You can come to this as the most extreme on either side and leave just as extreme, we’re not trying to convince you of, 'Your side is right, your side is wrong,' and we’re also not trying to have a debate." 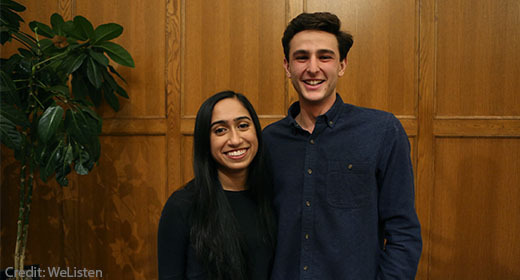 With two co-presidents, an executive board of students split 50/50 down the political aisle, and a successful first year on the books, WeListen plans to keep the conversation going, even beyond Michigan. Lerner and Thosar hope to spread WeListen to other colleges and engage even more students in this type of dialogue.